11th International Conference on the Establishment of Cooperation among Companies and Institutions in the Nordic Countries, the Baltic Sea Region and the World - in Kalmar, Sweden, November 19-21 2018. Researchers, scientists and students, professionals from business sector, municipalities and social enterprises, entrepreneurs and authorities from all countries are welcome! 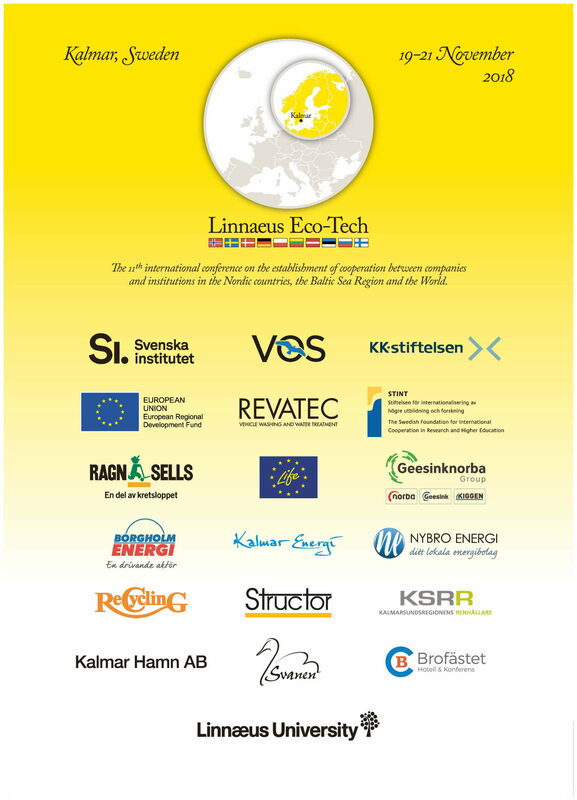 The conference Linnaeus Eco-Tech has been an academic tradition since 1997. The conference is organized by Linnaeus University in Kalmar, Sweden, every second year. One of it's main goals is to promote research and education cooperation among the countries around the Baltic Sea towards sustainability. It has become more and more obvious that the environmental issues have risen from local through regional to global concern. A Book of Abstracts i available via this link!. The call for abstracts and papers deadline has passed. But you can still Download Guidelines for Abstract Submission, papers and Download Guidelines for Poster Submission. Registration for Linnaeus Eco-Tech 2018 will stay open for a few more days: please use this link to register! For questions regarding registration please contact conference@lnu.se. Linnaeus University does not accept cash payments. Better for the environment and for our safety. You pay the conference fee by credit/debit card when register and you also use card to pay in our stores. The trend throughout Sweden is that fewer and fewer places accept cash. Sweden is a member of the EU Schengen mobility framework. If you have citizenship or an unconstrained residence permit in a Schengen country, you can travel to Sweden without further paperwork. In other cases, special rules might apply to your country. Please check with your local Swedish embassy's web pages, and check the general information at the Swedish immigration authority's web page. Sweden currently practices exceptional border controls on train, ferry and car communication over the national border. You should carry a valid Schengen national ID card or passport upon entering the country (and consider voting on your next national and EU elections in case you dislike getting ID'd within Schengen space). Persons who need an invitation or other documentation on their participation in the conference for visa application purposes shall take contact with the organizers with a specification of what documentation they need. Note: For real-time traffic updates, please follow the train service situation via this link. Take bus 402 from Kalmar Airport to Kalmar Resecentrum (train and bus station), transfer to bus 405 to Brofästet Hotel. The taxi stand is situated by Resecentrum (the travel center, train and bus station). A map of Kalmar is available via this link. Konferens International conference devoted to quantum theory, experiment and technology at Linnaeus University in Växjö, June 11-14, 2018. Arrival June 10, departure June 15. Cantus Planus Welcome to the next meeting of the IMS Study Group ‘Cantus Planus’ arranged at Linnaeus University’s campus in Växjö, Sweden on August 7-12, 2018. National conference in economics, October 4–5, 2018 Welcome to National conference in economics, arranged at Linnaeus University in Växjö October 4–5, 2018.